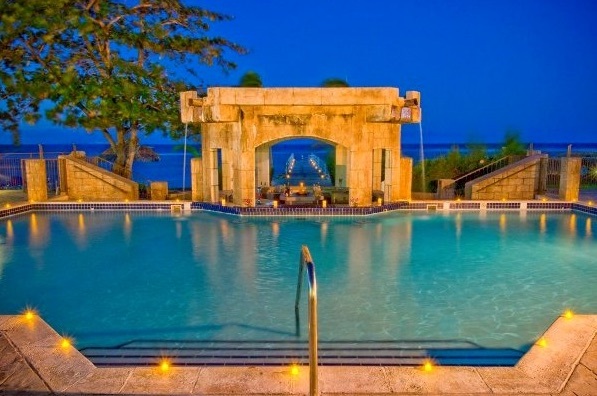 The Holiday Inn Resort Montego Bay was renovated in 2015 and features a private offshore island, a new adults-only section and pool, and special accommodations for kids. The all-inclusive resort features fully updated guest rooms, a refreshed lobby with ocean views,and four restaurants offering a variety of cuisines including seafood, Japanese, Caribbean and Italian. The resort boasts 107 junior suites, 26 one-bedroom suites and five meeting rooms able to hold up to 1,550 people. The property also has 10 spacious KidSuites which offer a kid-friendly design that allows children and adults to have their own space in the suite. The new RoseHall Club Accommodations and exclusive Lounge are located adjacent to the adults-only pool and swim-up bar. These rooms accommodate up to 3 adults, 18 years and older only. Located on a half mile of private beach, the property also has its own private offshore island called Tek-It-Easy Island. For guests looking to spend an afternoon off of the beach or out of the sun, the resort offers a game room and arcade, four tennis courts and a nine-hole mini golf course, also available for night play. While children enjoy a variety of staff-supervised activities as part of the Kid’s Club, which operates seven days per week, adults can take advantage of the property’s casino as well as various relaxing pubs and stylish lounges.